Raj Chettri works as an urban park ranger for Cardiff Council. He is passionate about the sites he manages and the volunteers that make it all happen. One of Raj’s sites is Howardian Local Nature Reserve, to the east of the city centre. The nature reserve is a former municipal tip that closed in the 1970s. The local school was asked to help manage the new nature reserve and some of those same school friends formed one of the first Friends Groups in Cardiff. For Martin Doe and Nigel Ferrand it has become a lifetime’s work. The Friends have transformed the site, which is now home to over 500 species. Last year, I left the country for about five months. When I came back, Cardiff was covered in beautiful, huge murals all over some previously pretty ugly buildings. I’d missed when it happened, but it was the doing of the lovely Modern Alchemists, through a project they organised called the Empty Walls Street Art project. 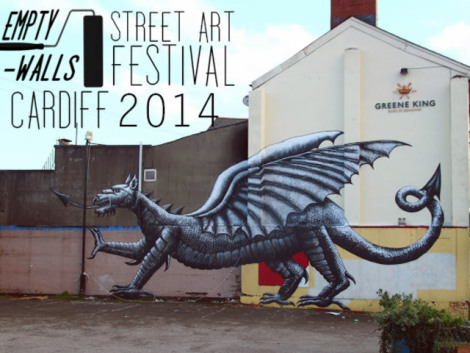 They’re running another Empty Walls festival this year! They’ve got a Kickstarter, and YOU can help them make it happen. I’ve pledged fifty quid towards it, because frankly Cardiff is streets behind other cities when it comes to street art and murals (like Bristol!) and I love looking at them around the city. This week, as Cardiff bakes in a heat wave, we learn to appreciate trees and green spaces in our cities like never before. The asphalt and walls heat up and radiate warmth all night, keeping the nights uncomfortably warm. Mark and Gruby’s front garden has a cool woodland feel, even through the hottest days of summer. As I cycle slowly up a rather steep hill adjacent to their house every day, I have plenty of time to appreciate the beauty of the space, even with car horns beeping at me to hurry up. Worth it. If more gardens could be like this one, we would be in a much cooler city, (in every way). A dedicated team of volunteers have created a beautiful communal garden within 10 minutes walk of the city centre in Roath by the Plasnewydd Community Centre. It is an oasis of calm and cheerfulness, with a welcoming spirit. Sophie and I joined the team on a July Saturday morning to find out about more about the project.